We have just bought an airbrush for our store. In one of the older blog posts I asked if anyone had any ideas about what we could do to improve our store. An airbrush and compressor was one of the ideas and I decided to act on it. It’s a bit of a beast but I had bought it originally to use with a large spray gun to whitewash our walls. Actually it has turned out perfect, because it is so large and so powerful the motor compresses the air really quickly and it takes ages for the airbrush we are using to lower the pressure enough to cause the motor to kick in. So instead of having a motor constantly running or one that kicks in every five mins, we get half an hour of noise free spraying at a time – sweet! It cost us £90 from Halfords. Our Airbrush is actually very basic, we might be tempted to go for a more expensive one later on but for now this is perfect for base coating models which is all we really need it for at the mo. It is the Aztek model A3205, we bought it from hobbycraft in our home town of Stafford for £50. 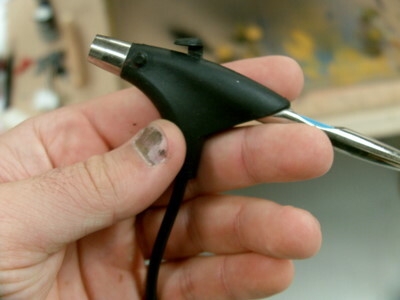 There were a number of airbrushes available and we chose this one for a couple of reasons. Firstly it wasn’t massively expensive, there were cheaper models available but they tended to be a bit too basic, and the quality just wasn’t there. Aztek is a brand that is owned by the paint company Testors which is a fairly respectable name in the US. Some of you may have heard of Testors Dullcoat which is used for priming models. 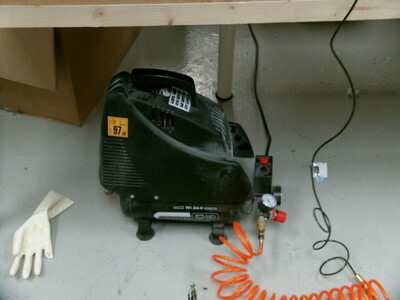 Another reason we chose this model is because it came with an adaptor in the box which connected directly to our compressor which meant no faffing about. 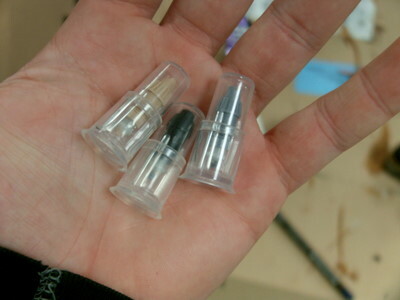 One nice feature is that you can buy a bunch of different nozzles for it, each of which has a specific purpose. So far I have tried the general purpose nozzle, the acrylic general purpose nozzle, and the fine line nozzle, and all of them have worked as described. 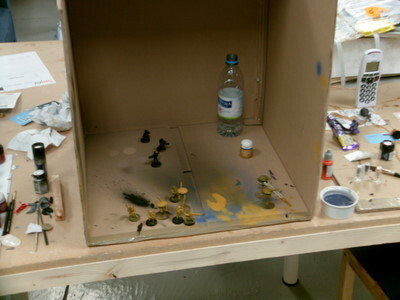 I cut the side off of a big cardboard box we had to make a little spray booth, and while it was definitely needed, the process of spraying is not that messy, you certainly don’t get the dust everywhere like you do when priming with a GW can of Chaos Black. One of the other things I bought was a gravity feed cup, I felt that it would help the paint flow a little better, it was also much smaller than the bottles that the airbrush came with so I didn’t waste any paint. But I forgot to put the lid on it and spilt some paint when I got all excited and started moving the brush around a bit too enthusiastically. I played about with the airbrush for a while making sure that I got the paint consistency just right before I tried it out on any models. 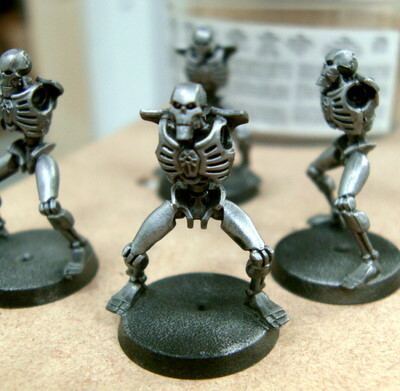 Then I took the plunge and decided I would start really easy and have a go at some Necrons. They turned out really nice! The first step was to base coat the models which I did with GW Chaos Black. One thing that I noticed immediately was that while I was getting superb coverage, the detail on the model was still extremely crisp with almost no paint build up in the very detailed areas. On one hand this is great, on the other it means that untended mold lines are highly visible and so I’ll have to pay more attention to them in the future. Next I sprayed them all Boltgun Metal, Then I spayed them with a coat of Badab Black which wasn’t watered down at all, just straight into the cup from the pot. Finally I dry brushed the models first with Boltgun metal, and then lightly with Chainmail. The models turned out really nice with dark recesses and very bright highlights, and the really nice thing is that the whole process for eight models like the one above, took only 30 mins from start to finish, including drying time! My next step will be to get hold of some of the Vallejo model air range of paints which are formulated so that you can put them straight into your airbrush without watering down, and that should speed up the process significantly. Interesting article, thanks for the post. Tony: It is. 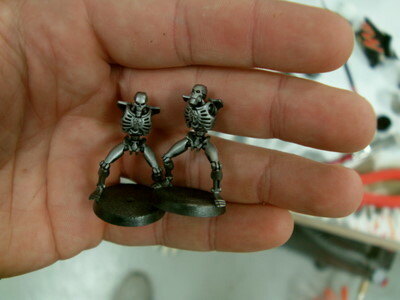 I've always figured you could use an airbrush to prime models and such, but use it to paint them completely... I figured that was something for tanks only. Great article. I have been using an airgun to prime my models. Using a foundation paint (i use astro grey) thinned with windex (about 1:1) works great as a primer, and is much thinner than the GW spray can. After that you can spray your base coat (assuming there isnt a suitable color in the Foundation range). Ron: You said your looking for ways to use one? Les over at awesomepaintjob.com has quite a few video tutorials where he uses his airbrush, and i think he even has an airbrush cleaning tutorial. Onyx Icarus: Excellent, thanks for the tip. cant imagine life without my airbrush anymore! Ben: Very true. But that might be a little weird for me to say since I buy cheap brushes and think of them and most everything else I use as disposable. Still, I'm sure you get what you pay for when it comes to airbrushes. Airbrushing acrylic paint as primer also means you can spray indoors without the rattlecan propellant oder. Check out our Homemade Airbrush Booth Post, simple and cheap, and much better than a cardboard box. Since I started using my airbrush, I've not looked back. While it doesn't work well for all lines (airbrushing my Trollbloods is limited to basecoats) it is fantastic for 40k where everything is very industrialized and shiny. @Onyx Icarus... I actually got interested in airbrushing because of the awesome paint job vids. I really like how simple the process is for such crisp results. I am trying to follow along with some of the stuff that Les does, but I'm going to have to do a lot of models before I can get that kind of result. Thanks for the links R3con, that would be the one thing keeping me from working indoors... a spray booth. I'll have top dig up some space and convince the WIfe it won't make a huge mess. Ron you could always get an affordable spray booth from Harbor Freight. I am sure your wife would be fine with a gigantic red sheet metal monster in the house.